The Times They Are A-Changin’. 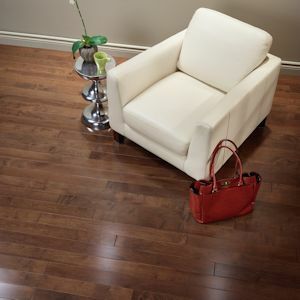 Muskoka Hardwood Flooring has recently transitioned the brand over to Vintage Flooring. Colors and constructions are all the same, it’s just the names that have changed. We’ve updated our site at www.hoskinghardwood.com with the new terminology and stain names from Vintage Flooring. Vintage Flooring still offers their flagship 3/4 IN. solid line, the Pioneered Solid Collection (formally Gallery), in Hickory, Maple, Red Oak and Ash wood species. Their 9/16 IN. engineered collection is now the Crafted Engineered Collection (formally Architectural), offered in Red Oak and Maple wood species options. Northern Solid Sawn and Solid Sawn (3/4 IN. structured/engineered) Collections have retained their names and still offer a great 4mm wear layer with a huge variety of wood species/textures/etc. Perhaps the best result of this transition has been the addition of the Vintage Flooring U-LOC Click Collection. The U-LOC Collection offers a range of stain colors in Maple, Red Oak and Hickory. It features a 7/16 IN. total thickness, a HDF core and can easily be floated over an underlayment. Click locking engineered flooring is perfect for homeowners looking to save money on installation with a DIY home project. In addition to transitioning brand name, collection names and stain color names over to Vintage Flooring, there also has been a change in the labels Vintage Flooring uses to distinguish between grades of their hardwood flooring. The Select & Better Grade (the clearest grade Vintage Flooring offers) will now be known as the Estate Grade. A step down from S&B/Estate was the Classic Grade, which is know known as the Select-V Grade. Select-V offers a little bit more color variation from board to board and could have more character marks including small, sound, filled knot holes. Character Grade will remain the same, offering unlimited color variation and natural character specific to the wood species. And finally, what used to be Muskoka’s Frontier Grade is now known as Heritage Grade in Vintage Flooring’s portfolio of products. The Heritage Grade is the lowest grade available and is only available based on accumulation. Heritage Grade includes mostly common grade boards with lots of color variation, unlimited large knots, pinholes, checking, worm holes and short board lengths. With the Heritage Grade, expect to factor in a larger waste percentage when ordering, which will allow you to be a bit more choosy with which boards you actually use in the floor. If you’re interested in the Heritage Grade products from Vintage Flooring, call our office at 508-643-0810 and we can check on current inventory levels at the mill. This entry was posted on Thursday, November 10th, 2016 at 12:20 pm	and is filed under Engineered Wood Flooring, Floating Wood Floors, Hardwood Flooring Manufacturers, Solid Hardwood Flooring. You can follow any responses to this entry through the RSS 2.0 feed. You can leave a response, or trackback from your own site. Bio: Hosking Hardwood Flooring has been a family run business since 1939. Jeff Hosking has been the hardwood flooring consultant for "This Old House" since 1984. He has also been the hardwood flooring consultant and a regular on the WHDH radio talk show called "The House Doctors". He has co-written chapters in "This Old House" books and has written a multitude of hardwood flooring articles for home improvement magazines, including "This Old House" Magazine. Over the years, Jeff's work has also been highlighted in such notable magazines such as "Metropolitan Home," "Practical Homeowner," "Country Home" and "Home Magazine." Hosking Hardwood Flooring retails Hardwood Flooring across the country at huge discounts. With their commitment to customer service, quality flooring as well as their product knowledge, they quickly became one of the largest flooring retailers in New England and the leading online retailer in the country. See About Hosking Hardwood to learn more.